The vertebrate antigen receptors are anticipatory in their antigen recognition and display a vast diversity. Antigen receptors are assembled through V(D)J recombination, in which one of each Variable, (Diverse), and Joining gene segment are randomly utilized and recombined. Both gene rearrangement and mutational insertion are generated through randomness; therefore, the process of antigen receptors generation requires a rigorous testing system to select every receptor which is useful to recognize foreign antigens, but which would cause no harm to self cells. 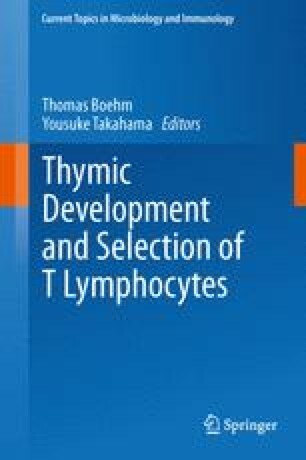 In the case of T cell receptors (TCR), such a quality control responsibility rests in thymic positive and negative selection. In this review, we focus on the critical involvement of self-peptides in the generation of a T cell repertoire, discuss the role of T cell thymic development in shaping the specificity of TCR repertoire, and directing function fitness of mature T cells in periphery. Here, we consider thymic positive selection to be not merely a one-time maturing experience for an individual T cell, but a life-long imprinting which influences the function of each individual T cell in periphery. We thank G. Morris and D. Donermeyer for their critical reading of the manuscript and comments.